One the of great properties of music is its ability to serve as a sort of emotional shorthand. Songs about love or loss allow us to experience these feelings vicariously while also drawing upon our own pool of half-buried emotion. Songs can have personal connections to us, but what I’m talking about are the broader, surface-level connections that we all feel to some degree. Every time you hear Don Henley’s “The Boys of Summer” you don’t get a knot in your stomach thinking about a dark-haired girl I knew in 8th grade. But when we all hear The Beatles “Something” or Billy Joel’s “Just The Way You Are” we all feel an approximation of the same thing. This ability to instantly invoke feeling makes music the perfect complement to film and television shows that want to underscore and heighten their down dramatic moments. When used effectively, the results are memorable and wonderful. That said, there are some songs that are used a little too frequently in films/shows, turning a wonderful thing into a cheat, a lazy-shorthand for actual emotion. Worse, there are other uses of songs in various pop culture where, even when not overused, become so iconic that the song ceases to have a life outside this one specific use. For me, these songs are ruined. Perhaps ruined is too strong a word, but whenever a song becomes unlistenable without conjuring up residual cultural baggage that’s what it feels like to me. Ruined. 1. “Stuck in the Middle With You” by Stealers Wheel. Most casual music fans are probably under the impression that this is a Bob Dylan song. “Stuck in the Middle With You” feels like a Dylan song because the song was conceived as a spoof of Dylan. The song was released in 1972 and by 1973 reached all the way to #6 on the Billboard Music Charts. Songwriters Gerry Rafferty and Joe Egan put out two more albums and then disbanded, with Rafferty going onto have moderate solo success including a hit with his 1978 song “Baker Street.” The song probably would have remained a curiosity/answer to a trivia question had director Quentin Tarantino not resurrected the song for his feature film debut Reservoir Dogs. The song took on a fresh, demonic connotation when Mr. Blonde, played by Michael Madsen, gleefully tortures a policeman while dancing to the track. Now 99.99% of people are unable to hear “Stuck in the Middle With You” without thinking about ears being lopped off. 3. “In Your Eyes” by Peter Gabriel. Originally released in 1986, “In You Eyes” was the first song on the second side of Gabriel’s fifth solo album SO. Essentially a perfect time capsule of 1980’s pop, SO also famously featured the hits “Big Time” and “Sledgehammer.” At the time of the album’s release, “Sledgehammer” was the bigger hit due in part to a really cool stop-motion animated music video. 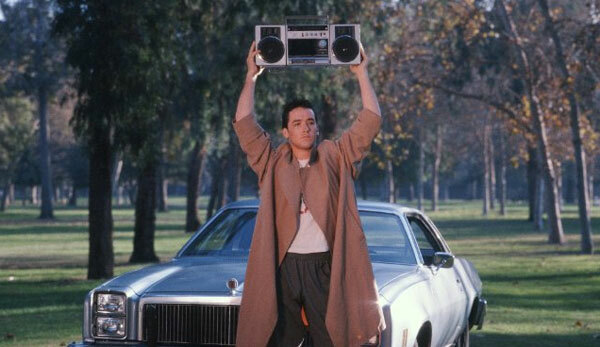 But all that changed three years later when Cameron Crowe used the song in his teenage love story Say Anything… The song gained renewed attention and immortality when, near the film’s climax, John Cusack blasts the song from a boombox hoisted high over his head. I was but a babe when Say Anything… came out, so the nostalgia is a bit lost on me, but even I can’t hear Gabriel’s song without thinking of Cusack. The song’s been used over the years in similar context, but everybody is really just copying Crowe. 4. “All Along The Watchtower” by Bob Dylan but covered famously by Jimi Hendrix. Everybody agrees that Hendrix was a guitar god, and his cover of Dylan’s “All Along The Watchtower” is an amazing interpretation (seriously, have you heard Dylan’s version?) but much like “Gimmie Shelter” the song has been co-opted by filmmakers who use the song as a kind of shorthand for “doing drugs in ‘Nam.” The song’s use in Forest Gump is the gold standard of such use (that film is probably one of the worst offenders when it comes to using music as lazy shorthand). The track’s overuse has reached the point of cliché, I actually laughed when I saw Zack Synder’s Watchmen film where the song’s use bordered on parody. 5. “Bad to the Bone” by George Thorogood & The Destroyers. The title track off the George Thorogood’s 1982 album, “Bad to the Bone” was not a hit. But within a few short years “Bad to the Bone” became the band’s most recognizable hit. How you ask? Because the song has been used countless time to telegraph to the audience that a certain character is a badass. Most famously the song was used in conjunction with Arnold Schwarzenegger in T2: Judgment Day when the muscular robot first dons his iconic black motorcycle jacket. “Bad to the Bone” was a kinda cool tough-guy song that has now been watered-down into a novelty song, thanks in part to it’s uber-level of machismo. Today the song is now mostly used in comedies in contrast with a particularly un-tough character (i.e. a loveable loser). 6. “What I Am” by Edie Brickell & The New Bohemians. The impetus for this list was the recent use of Edie Brickell’s 1988 one-hit wonder “What I Am” on HBO’s Girls. This season on the show, an ill-advised cover of the song that makes its way onto YouTube and haunts a particular character. I hadn’t thought about/heard this song in ages, but the day after I saw the first episode of Girls third season, I started noticing the song was on the radio more than in previous years. A catchy chorus and twisty, semi-thought provoking lyrics are now rendered meaningless thanks to the series. This is now a song about defeat and the soul-crushing reality that none of our dreams are going to come true. Thanks Girls. There are countless other examples of song ruined by pop culture, Queen’s epic “Bohemian Rhapsody” was forever stamped by Mike Meyers and Dana Carvey in Wayne’s World as was “Sweet Home Alabama” in every movie to every take place in the South (or feature Southern characters). I’m sure just how ruined these songs are depends on your film/TV watching habits. I’m curious to hear what songs you the reader feel have been used to death or ruined by pop culture. Speak up in the comments section.